Your card is gorgeous, love the cute birdie. Also wishing you many safe and happy miles with your new lean machine. Gorgeous as always Sassy...and loving the new wheels too hun...have fun playing...!! Fabby card ...and car.... Which do i like the most????? Lovely card Sassy. Loving the car too - enjoy! Your card looks fab, as does your blog; loving the chandelier! gorgeous card. hope that you are adjusting to new work hours - and not working too hard! you must take care of your health too! 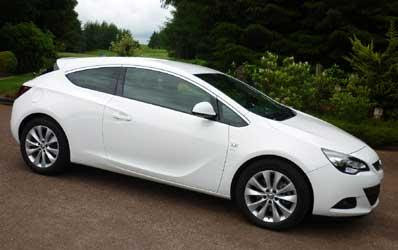 and love the new toy - very sporty looking! enjoy! Hi Sassy, love the bird and cage and the details and colours are fab. Car is rather special too hun!!! Stunning card Sassy gorgeous detail and very elegant. Wow I love your new car, it's fabulous happy driving and enjoy. 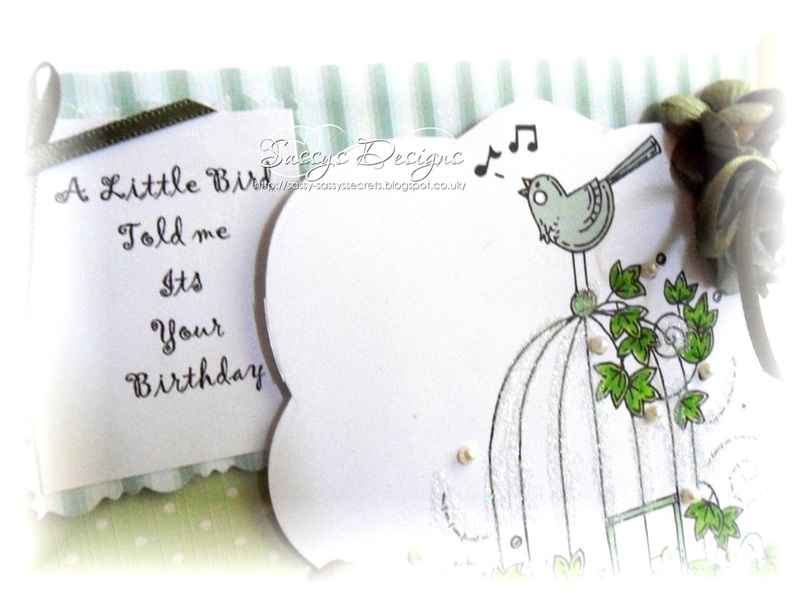 Such a gorgeous card Sassy, I love the image and beautiful delicate colours. WOW! Your car looks amazing! Fantastic card but oh my goodness, what a car! Drive carefully and enjoy! And I'm also loving your new flashy sporty little number bet you feel like queen of the road in her !!? so gorgeous sassy.beautiful image and design and i love your colours. Beautiful card, and enjoy your new car, love it...zoom, zoom, zoom! Beautiful card Sassy, and your new little toy is GORGEOUUS. Your card is beautiful and that car looks pretty good, too! Your card is really lovely sweetie and your car is awesome. Lovely card and fab new car :) Tfs !! your right i thought i had escaped the snow!!!! was pretty mind. A gorgeous card Sassy, beautiful colours! And a gorgeous car too, congrats! 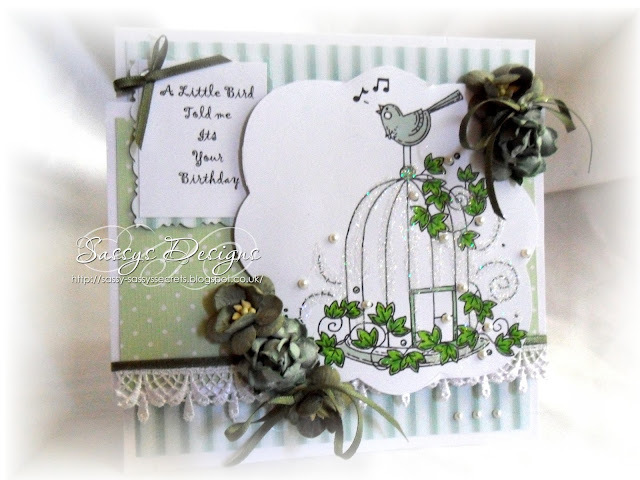 Love your bird cage card Sassy, so pretty and elegant. Boy your car is smashing. Wish you lots of happy driving years. erm, love your card and your car!!! LOL! wow I have noticed the wonderful background...I def. have to come for a visit it looks beautiful where you live!! And you know, your white horse (the car) look perfect for this kingdom lol!